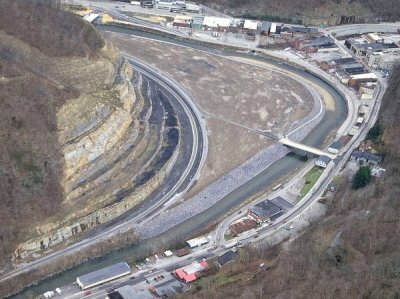 GRUNDY, Va. With loads of dynamite and government dollars, the leaders of this struggling coal town in southwest Virginia set to work years ago on a bold project to engineer their way out of poverty and the flood path of the Levisa Fork River. The "New Grundy" of planners' sketches was an Appalachian version of an upscale urban village, with distinctive shops, apartments and high-tech businesses that would spark an economic revival of the town. This grand vision didn't fit in the canyon-like confines of the old Grundy (population 1,100). So with a miner's disdain for the in commodities of geology, town leaders recruited the Army Corps of Engineers and the Virginia Department of Transportation. They demolished dozens of buildings along Main Street and, to make room for the new town, blasted away a mountainside. The $196 million project-costing more than $175,000 for every man, woman and child in Grundy was scheduled to deliver the new town this year. But it hasn't worked out that way. Many owners of the razed businesses pocketed their government payouts and don't plan to reopen. The original goal of a revived small-town community morphed into something quite different-a future now heralded by an empty lot with a solitary blue sign sticking up from the barren expanse. LEBANON - March 19, 2009 - The Virginia Coalfield Economic Development Authority (VCEDA) today approved a $2 million grant to the Town of Grundy Industrial Development Authority (IDA) to be used for the construction of a 500-car parking facility on the town's 13-acre redevelopment site, which will be the base for a major retail center planned to be built on top of the garage. "VCEDA is excited to be a part of the redevelopment of the Town of Grundy, and this grant will help jump start construction of this parking facility that will be a key part of this important and unique project," said Jonathan Belcher, VCEDA executive director. "The new road through downtown Grundy is now complete, and the town redevelopment site is ready for construction." Belcher said the redevelopment project is expected to retain and create 1,000 direct and 1,000 indirect jobs, including employment from the planned retail center. The town redevelopment site is part of a massive $200 million flood-proofing project designed to help deal with flooding issues that have plagued Grundy over the years. The Town of Grundy is the county seat of Buchanan County and also the location of the campus of the Appalachian School of Law. VCEDA also approved a $1 million grant and a $1.5 million loan to assist with the Grundy Redevelopment Project in 2000. A portion of funds from this prior loan and grant package also will be used towards the costs of the new parking facility. 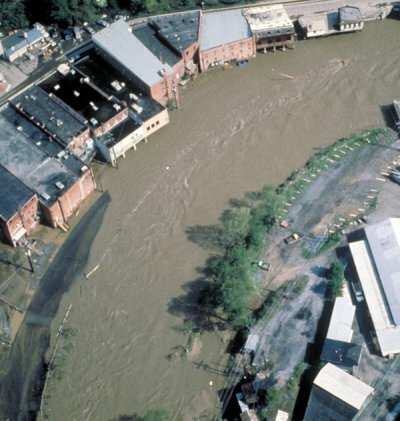 In 2002, VCEDA agreed to allow existing and new businesses in Grundy to move into an industrial shell building that was funded by VCEDA, so that these businesses would be able to operate as the town redevelopment and flood-proofing project was completed. In 2003, VCEDA agreed to allow this shell building, now called the "Grundy Plaza," to be permanently used for this purpose. GRUNDY - August 12, 2009 - The Virginia Coalfield Economic Development Authority (VCEDA) closed a $2 million grant today to the Industrial Development Authority of the Town of Grundy to be used for the construction of a 500-car parking facility on the town's 13-acre redevelopment site, which will be the base for a major retail center planned to be built on top of the garage. "VCEDA is excited to be a part of the redevelopment of the Town of Grundy, and this grant will help jump start construction of this parking facility that will be a key part of this important and unique project," said Jay Rife, VCEDA chairman. With the new road through downtown Grundy complete, the town redevelopment site is ready for construction, said Jonathan Belcher, VCEDA executive director. Grundy's redevelopment site is part of a massive $200 million flood-proofing project designed to help deal with flooding issues that have plagued Grundy over the years. The Town of Grundy is the county seat of Buchanan County and also the location of the campus of the Appalachian School of Law. VCEDA also approved a $1 million grant and a $1.5 million loan to assist with the Grundy redevelopment project in 2000. A portion of funds from this prior loan and grant package also will be used towards the costs of the new parking facility. In 2002, VCEDA agreed to allow existing and new businesses in Grundy to move into an industrial shell building that was funded by VCEDA, so that these businesses would be able to operate as the town redevelopment and flood-proofing project was completed. In 2003, VCEDA agreed to allow this shell building, now called the "Grundy Plaza," to be permanently used for this purpose.